Caption slip reads: "Photographer: Swaim. Date: 1957-12-17. Reporter: Swaim. Assignment: Chihuahua pups. 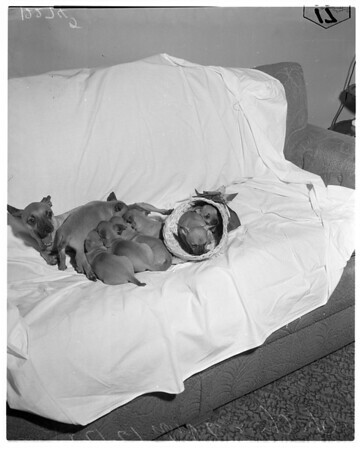 17-18: 'Chi Chi', 4-year-old Fawn colored Chihuahua, and her seven "robber" pups (all have black masks). Even the horn of plenty couldn't hold them all. 7-8: The seven pups (5 males, 2 females) without Chi-Chi".